Fans of the long-running MX Vs. ATV franchise of games can rest easy: Nordic Games have resurrected the series with Rainbow Studios at the helm in MX Vs. ATV Supercross. MX Vs. ATV Supercross is a game that many fans of the MX Vs. ATV series never expected to see. Like many other IPs it, along with developers Rainbow Studios (AKA THQ Digital Studios Phoenix) was part of the mass sell-out of THQ’s assets following the publisher’s bankruptcy. The franchise was picked up by Nordic Games alongside the Red Faction and Darksiders franchises, and is the first major title the company has released utilizing the rights they gained during the buy-out. The MX Vs. ATV series of racers are not complicated games, and MX Vs. ATV Supercross does its best to embrace those elements that made the series popular to begin with: lots of vehicles, dynamic raceways, and lots of dirt. 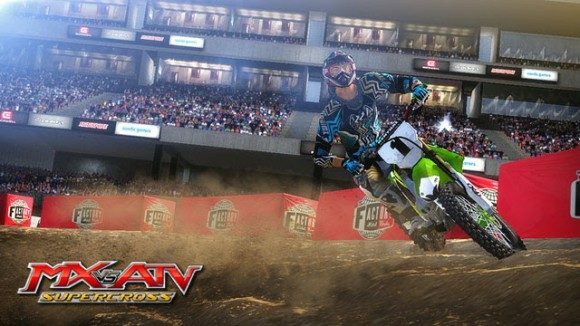 Rainbow Studios haven’t skimped any on the content for their latest release, with MX Vs. ATV Supercross having 17 tracks, more than 60 riders, customization options, and of course both split-screen and online multiplayer. Unfortunately the split-screen is limited to two-player simultaneous, but online offers up to 12 players at once duking it out over the jumps and through the chicanes as they try to determine who is the best off-road racer of them all. Historically the MX Vs. ATV series has received somewhat mixed reviews, with some of the later releases being praised by fans while critical reception was a little harsher. Nevertheless, MX Vs. ATV Supercross has a strong pedigree to live up to in fans’ eyes. Both press and players alike have been excited to see what Rainbow Studios and Nordic Games do with the franchise, though only time (and reviews) will tell if they were successful in their attempt at resurrection. The game is available now both via retail and digital download for the Xbox 360 and PS3, with a PC release expected to be available some time soon.